Fabulous card! Absolutely wonderful CAS card and I'm waving hello right back at ya! Wonderful card lynn, I love it!! Why can't I make a simple card like this! I love it! I really need to practice my CAS style! Gorgeous colours used and the twine on the anchor is perfect! Precious card, Lynn!! Fabulous CAS nautical design! Just how adorable are those waves. This card is just the cutest thing evah! What a fun way to say hi. Love the twine for the anchor too - great way to add a touch of color. Waving hello back ;) A beautiful CAS card Lynn, loving the anchor! CAS simplicity to the next level. Wonderful Lynn. What a great way to wave hello! I love your git 'er done cards! Too cute Lynn, the anchor is wonderful. Wonderful card and pun, Lynn. What a great nautical card!! I love those blue waves with the big anchor! The twine is just perfect! That's such a rotten pun, you should be banned from the waves, Lynn! lol I love the CAS style and your perfect use of red, white, and blue. Did you plan it for that color combo or did it just happen? I love your CAS cards. You definitely are a master at it. Gorgeous CAS card as always Lynn. You've got to love those git'er done cards! Love the layout & the twine on the anchor! 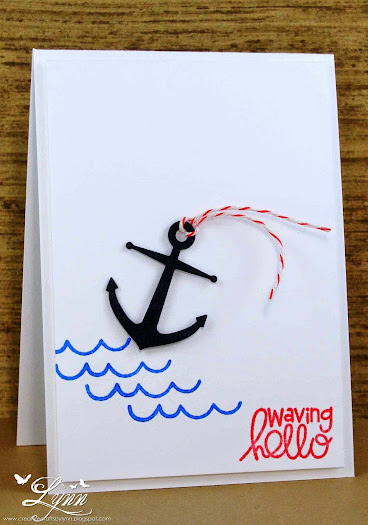 Really cute hello card and love the anchor too! Fabulous CAS card, I LOVE that anchor die!! Oh that anchor makes my heart dance... so sweet and simple. Cute as can be and brilliant design! Soooo cute!!!!! I just love this CAS nautical design with the PS stamps....I will be casing this one!!!! Awesome CAS card and so perfect for summer! !